NOTE: If your gonna join this community then post and if not then don't join. Thats the point of this community anyway. 1) if you are [ n o t ] an ELVIS (& lisa marie) fan, you are not welcomed here! 2) if you are going to post pictures, please make them appropriate! 4) when you first join the community, please post an entry notifying your mod. 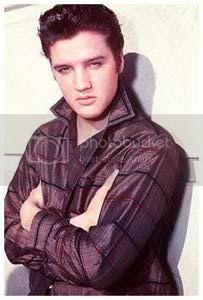 7) don't stray off topic, this is an Elvis Presley community "thank you very much"!! 9) and last but surely not the least, if you don't follow these rules you will be banned!! i need people to post comments & entrys to keep this community going...every now & then wouldnt hurt you! have you ever been to Memphis, Tennessee or any other part of it? do you dis-respect anyone from the Presley family? if so, who? Elvis was playing a concert and there was a group of chiks in the front row that had a banner. In between every song the girls would stand up and hold the banner that said "Elvis is the King"
...and everytime, Elvis would say ,"Nah baby...Jesus is the King"
At Graceland they have the trash cans all 3 in a row and they say "Thankyou", "Thankyou", and "Very Much"
ann-margret community. awesome community. go & join!